Where to with children's agency? Here 's a presentation about natural communications and relationships happening right under our feet. Definitely something vital for us all to think about and re-value in how we work and live. Thanks to Francesca Manfredi, atelierista at Loris Malaguzzi International Centre Preschool & Primary School, Reggio Emilia, for originally noticing and posting this. Are you looking for ways in which your children can explore their world through music and movement? This slideshow/video summarises our 2-year project with a nursery and primary school in Kendal. Discover what we did, what we learned, what obstacles we faced and how the children engaged. Production has been supported by Youth Music, and so we are able to make this free to download. 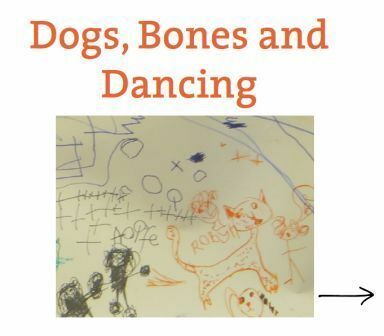 "Dogs, Bones and Dancing richly expands the story I have been trying to understand, in two ways. First, it is clear that, for each of these three-to-five-year-olds, the growing vitality of a human body with its many clever parts has become a thrilling adventure. Secondly, this life adventure is one to be explored in play with companions who love to share the energy and grace of moving, and the new stories it tells. Such advances in cleverness with cultural understanding depend on the vitality of natural self-expression, and the enjoyment of co-creating with others in making actions and memories meaningful and productive of common good."